The Central Jersey Blood Center will hold a blood drive at the Neptune City Community Center, 117 3rd Avenue, on Saturday, August 16 from 9:00 am – 3:00 pm. The blood drive is being held in honor of seven year old Neptune City resident, Lauren Blecki, who was recently diagnosed with Aplastic Anemia, a condition that occurs when your body stops producing enough new blood cells including white and red blood cells and platelets leaving the person fatigued and at a higher risk of infections and uncontrolled bleeding. During a Neptune City fun run at the Shark River Yacht Club in mid-July, Lauren collapsed, feeling faint. She quickly recovered, however her mom, Tiffany Blecki, decided to take her to the pediatrician the following Monday just to be sure. 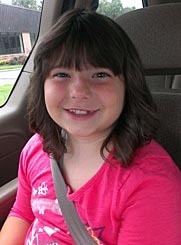 The pediatrician saw no immediate signs of trouble, but took Lauren’s blood and recommended a trip to the cardiologist. Two days later, Blecki received a phone call from the pediatrician telling her to bring Lauren immediately to the emergency room due to a “critical” cell count. After blood work at Jersey Shore Hospital, Lauren was transferred to the Robert Wood Johnson Children’s Hospital in New Brunswick who received a diagnosis on July 22. Since her diagnosis, the Blecki family, including Lauren’s father John and 12-year-old brother Adam, has been making weekly trips to the Robert Wood Children’s Hospital to receive blood and platelet transfusions. She is currently on a treatment plan of anti-rejection medication, steroids, and ATG (anti-thymocyte globulin), which increases her immunity. Recently Adam was tested as a bone marrow donor. If the match is successful, Lauren would receive the bone marrow transplant at the Philadelphia Children’s Hospital where that would decrease her immunity to zero and then be isolated for 4-6 weeks to prevent infection. Should her brother not be a match, Lauren would be treated with immunosuppression therapy, and possibly receive a bone marrow transplant from a donor. “The best possible scenario (for Lauren) would be if Adam was a match,” stated Tiffany. Despite the difficult and challenging situation, Tiffany is mesmerized by Lauren’s resiliency. (Almost) lifetime Neptune City resident Tiffany, who has been in town since 3rd grade and her husband who grew up in Shark River Hills is thankful for the support of their town. “What’s so great about being a part of a small town is that everyone pulls together, whether it’s Hurricane Sandy or an ill child, it’s a great support system,” stated Tiffany. Blood donors are asked to eat before attending the blood drive. All donors must be healthy, 17 years of age or older, and weight at least 120 pounds. For more questions, please contact Karen Moore at CJBC 732-842-5750 ext. 243.